Our online fire marshal training courses are a quick and also easy way to train fire marshals. Courses are available as single general courses and also as tailored and bespoke websites. Our tailored and bespoke websites are ideal for fire marshals and also general staff. July 17th has good availability in the afternoon. Aug 22nd has good availability. Afternoon session fully booked. Sept 19th has good availability. Afternoon session fully booked. All of our fire marshal training courses are IFSM accredited, so all persons get a training certificate after the course. They will also get online training notes if requested. The course is in four parts: Part one looks at fire law, causes of fire and also some case histories. Part two includes classes of fire, fire extinguishers and also a practical extinguisher session (open courses). We then take a short refreshment break. Part three looks at proactive fire marshal issues such as fire emergency plans, hazard spotting, safety checks and also fire drills. Part four looks at reactive measures such as accounting for persons, evacuating buildings, disabled procedures and also general evacuation advice. Either call us or email us for availability. We will reserve a place for you and also send our booking email. We hold your place for five working days and will confirm your place once we have heard from you. Note: We do not hold spaces on open courses if there is less than five days before the course date. So if you need a late booking, remember it will be first come, first serve! Either call us or send an email with your preferred training dates. City Fire Training have a number of trainers, so picking your favourite date should be easy. We will reserve your course date and send a booking email. We will also ask you to agree our terms and conditions. Once we have heard from you, your course is booked! Remember in house courses can be for any number of persons, so this really is excellent value (limited to 20 persons with a live fire training session). Do you have to have live fire extinguisher training? 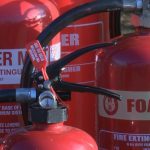 Live fire extinguisher training – Do you have to have this? Do staff have to have live fire extinguisher training? That was a question to our office yesterday. All staff in a workplace need to know the contents of their fire emergency plan. This includes what to do if they discover a fire, action to take on hearing the alarm, the fire procedures and also fire fighting equipment in the workplace. However, there is no requirement for live fire extinguisher training. Notwithstanding this, many managers do want staff to tackle small fires so they can fight a real fire if one occurs. 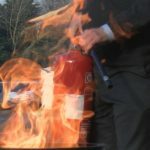 Our fire marshal courses and also fire extinguisher courses can include live fire training sessions. We use an LPG fire training rig and our extinguishers at your site and also at our site in London. 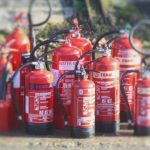 Using water, foam and CO2 extinguishers your staff can gain useful experience, so that they have the confidence to tackle fires in their workplace. Each person on our course will also get a training certificate and online notes. Remember all of our courses are IFSM approved, so your staff can be sure of excellent fire training. As an approved centre we can also adapt the course to include your fire plans. Therefore your staff can have training tailored to their place of work. Booking one of courses is so easy! Either call or email us with your preferred fire training dates. Once we have agreed a date, we will send a booking email and also ask you to agree our terms. Once we have your details your course is booked. We will invoice you within one week and our trainer will contact you a day or so before the course date. This is so we can arrange an arrival time and discuss room layout and also any outside space requirements. We have new fire marshal training courses London dates, so now is great time to book your places! Our new dates are 14th March, 24th April and also 14th May 2019. These courses are IFSM approved courses and also include a live fire extinguisher session. Each person will get a training certificate and also online fire training notes. 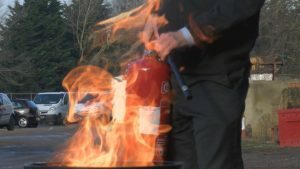 Our fire marshal training courses London are an ideal platform for fire marshals and fire wardens. As well as learning about fire law, how to get people out of a building on fire and types of fire. They also get the opportunity of tackling small fires with fire extinguishers on our training rig. This gives attendees great confidence, so if a fire occurs in your building they will know what to do! Booking a course with us is so easy! Either email or phone us with your preferred dates. We will send a booking email and ask for some details and also ask you to agree our terms. Once we have received your details your course is booked. It really is so easy!! All of our trainers have worked as tutors for the Fire Service Safety Partnership. They have carried out thousands of fire training courses and overseen thousands of practical fire sessions, so your staff are in safe hands. Our team regularly carry out refresher making sure that they stay up to date with the latest developments in fire safety. All have worked as workplace fire safety officers or emergency planning officers with the fire service as well as having an operational role. Do you need to know more about our open or in house fire marshal courses? Either call us or email us for more details! Our fire marshal training courses London programme is available as open, in house and also off site training courses. Managers may also pick from courses that include live fire training or without. 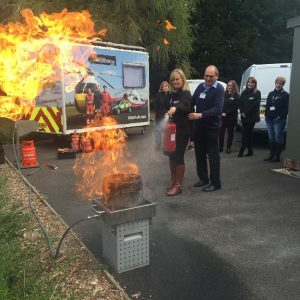 This three hour approved course is delivered by trainers from an approved fire training centre, so your staff can be assured of excellent training. What will your staff learn? This course is split into four parts. Firstly, we discuss fire safety law and also common causes of fire. Next we look at the different classes and types of fire and also fire extinguishers. Those selecting in house and off site courses can also pick a live fire training session at this point. We then take a short break before returning to the classroom. Next we look at the role of fire marshals. Firstly, we look at their non emergency role and include hazard spotting, safety checks and also fire drills. Lastly we look at their emergency role. We consider fire emergency plans and can include your company plans in at this stage. Our trainers will discuss accounting for persons, evacuation and also how fire marshals can keep safe by using the correct way to open a door. Finally, we look at disabled fire plans and also general evacuation advice. Each person on the course will get a certificate and also online fire training notes. Booking a fire marshal training courses London programme for your staff is so easy! Either call us or email us with your preferred dates. Once we have agreed a date we will ask for some company details and also ask you to agree our terms and conditions. Once we have your details, your course is booked. Our trainers will call you a couple of days before the course to discuss our in house needs. Persons attending our open courses will get joining instructions sent to them a week or so before the course date. Our fire warden courses London programme is popular with many clients. Today we trained 18 fire warden from a number of companies and they also took part in a live session. Our clients were a mix of office staff, restaurant and café staff, colleges and also from an engineering place of work. 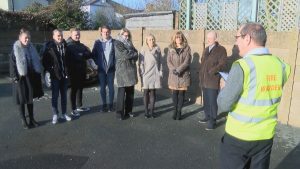 Regular readers of this blog will know that a place of work must have fire plans and also persons to put the plan into place. These persons are called fire wardens or fire marshals. Regular training is needed to ensure wardens know what to do, so why not send your wardens to our course! This accredited course is split into four parts. Firstly, we look at fire law, common causes of fire at work and also some case histories. Persons on the course then learn about types of fire and also fire extinguishers. Next we look at non emergency roles and this includes hazard spotting, fire plans and also drills. Lastly we look at how fire wardens keep safe, how to get persons out of a building on fire and disabled fire plans. Since this course includes a live fire training session, persons on the course are invited to fight some small fires. This will provide confidence, so if a fire starts in your building your staff will be ready! Booking one of courses is so easy! First decide whether you want places on an open course or have an in house training session. Email us for course and also date availability. Once we have agreed a date we will send our course booking form and also ask you to agree our terms and conditions. Once you have replied with your details your course is booked!